I may have broken free from my pancake monster days because ... I finally got myself a waffle maker!!! Can you tell how excited I am about this?! I almost feel as joyous as the day I received a Vitamix for a gift. Walker and I often joke that I cannot get another small kitchen appliance until we have a bigger kitchen (note: we currently have a very small kitchen) but this waffle maker was definitely an exception, for good reason though! I really wanted to have a waffle recipe in my third cookbook, The Joyous Cookbook (stay tuned for a post about that soon) so I would say that's a good enough reason to finally invest in one! I've been looking for one for a while and all the waffle makers I've been eyeing at discount stores for the last few years are always so rickety, but this one is not! We ordered this waffle maker from amazon for 50% off! 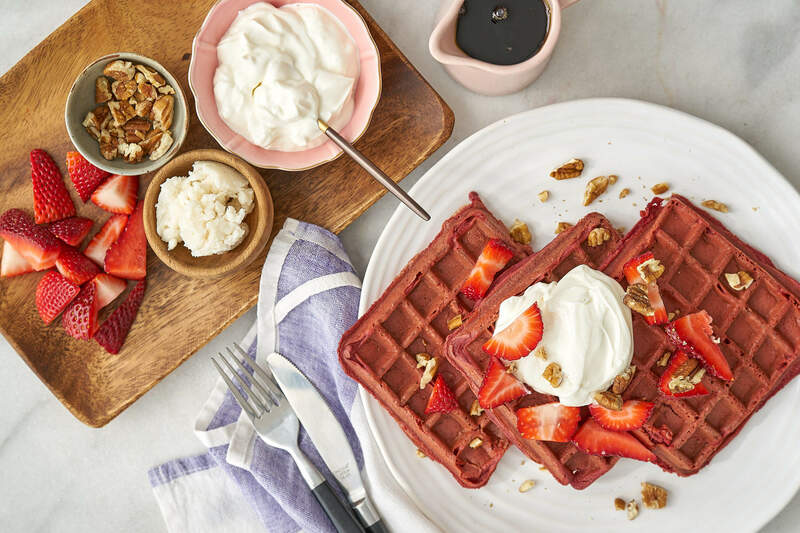 I was inspired to make these waffles with beets because I've been working on a lot of beet recipes this week for my third cookbook, The Joyous Cookbook, so I was feeling inspired to create these waffles! Beets and strawberries, as you might already know if you're a regular reader, are a wonderful pairing, truly a flavour match made in heaven! For example, have you tried? If you're using a square waffle pan, this recipe makes 9 square waffles. 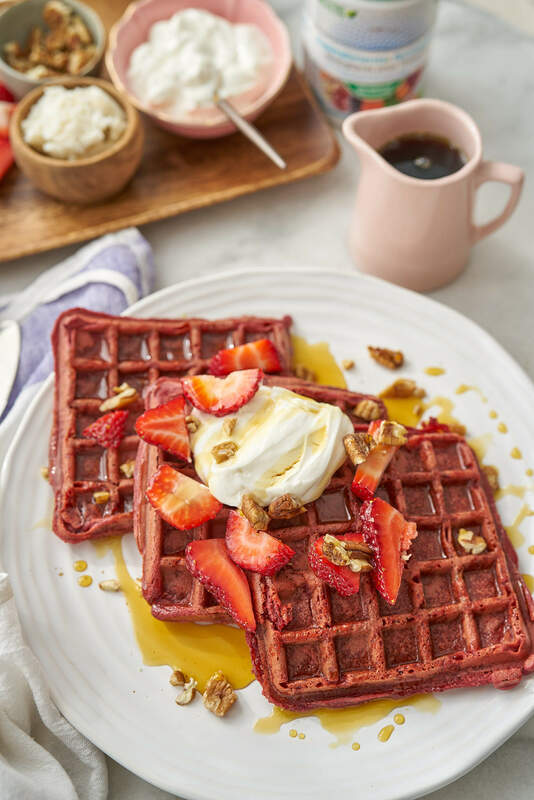 They take a little longer than your average waffle batter to cook because they are more dense with the beets and strawberries. I cooked them on medium-high heat for 4 to 5 minutes. If you open the waffle lid and it pulls apart then it hasn't cooked long enough. You might be wondering why I added Genuine Health's fermented organic gut superfoods? Well, they help feed the good bacteria that live in your large intestine. I take this superfood supplement daily in some form or another, but mostly in smoothies because it contains fermented prebiotics that are rich in polyphenols. 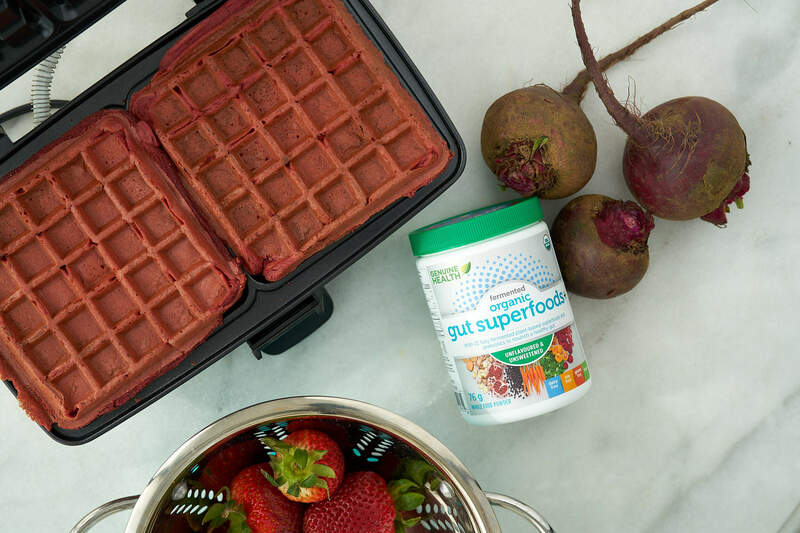 Eating these waffles are just another delicious way to incorporate the "superfoods". Even though Vienna loves smoothies, it's nice for her to get them another way too ... and what kid doesn't love waffles? In case you're wondering, most health food stores in Canada and the U.S. sell Genuine Health's organic fermented gut superfoods. Now because the strawberries were not very sweet and I wanted to balance out the beet flavour, I did add 2 tbsp of coconut sugar to the batter, but of course, you don't have to. It does make them more tasty, but if you're topping them with maple syrup already, then you may wish to skip that addition. As for topping these waffles, you've got many delicious options! From coconut butter to coconut yogurt , strawberries to pecans and of course, some maple syrup! I also sprinkled some cinnamon because who doesn't like an extra sprinkle of cinnamon?! 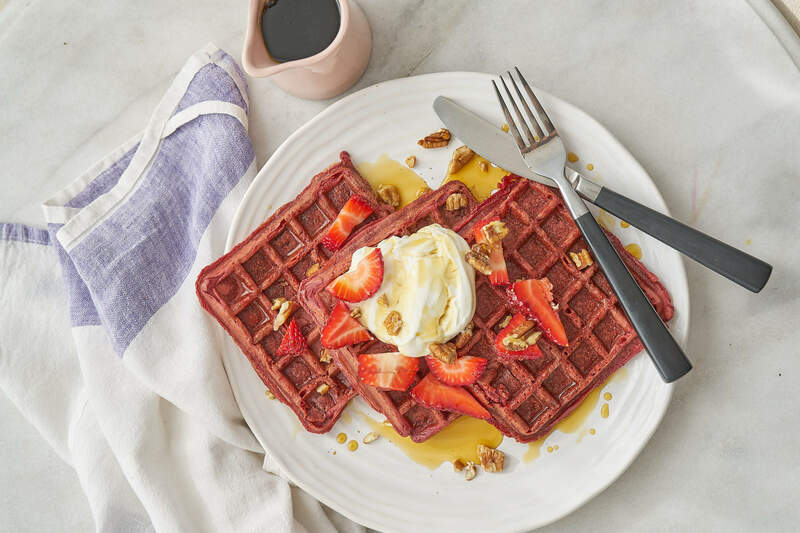 At last, here's my recipe for Beet Strawberry Waffles! Add all ingredients to a high powered blender and pulse until smooth and creamy. Preheat waffle maker to medium-high. 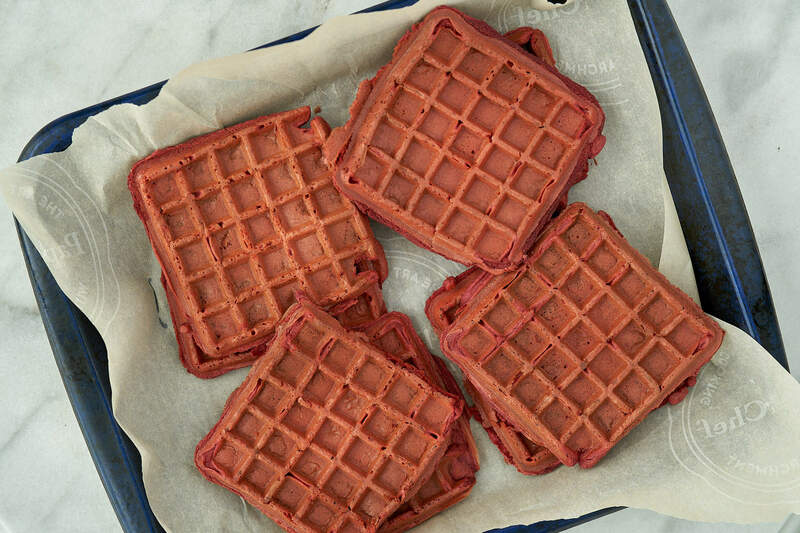 Pour 1/3 cup batter into each side of a square waffle maker and cook until crisp. Top with fresh cut strawberries, coconut yogurt and maple syrup. Enjoy immediately! *This also works well with the "Summer Berry Pomegranate" flavour gut superfoods. **You can omit the coconut sugar, but if your strawberries are not sweet the batter may not be as tasty. Stevia is also an option! If you've never cooked beets before, here's a recipe. Just scroll to the bottom of the recipe card for instructions. Now in case you're wondering if these can be made into pancakes, my initial thought would be yes, however, I haven't made them so I don't know how easy they will flip. You'll be happy to know they freeze well: just pop 'em in the toaster the next day to reheat them and top with your fave ingredients. Have a joyous rest of your day friends! This post was created in partnership with Genuine Health, however all opinions are always my own. Read more about partnership ethos here. I linked in my blog post to the one I got on amazon (third paragraph). It has a non-stick coating. Most of them do. As long as you're not scraping it or using abrasive materials you will not be exposed to the non-stick surface. I personally avoid all products that emit PFOAs. I assumed this waffle maker is PFOA-free but I will double check with the manufacturer and advise. Keep in mind not all non-stick surfaces are carcinogenic. My ALL CLAD pans that I use for omelettes and whatnot are all non-stick but PFOA free. Hope that helps! I'm not sure to be honest. The batter is much more moist than your typical batter because of the addition of the beets and strawberries. I have a really delicious pancake recipe without eggs here: https://www.joyoushealth.com/16527-blog-world-s-easiest-pancake Oat flour holds together really well so if you're looking for other egg-free recipes, typically oat flour is a good one. These look and sound yummy- going to give them a try! Curious if cashew milk can be swapped for almond milk in this (and most) recipes. Hi Joy, I really enjoy your blog and cookbooks, I’ve been working through them for a while now and have yet to find a recipe I don’t like. I was just wondering if you have a recommendation for a substitute for the brown rice flour - I have a friend who has both type 1 diabetes and celiac and she was just telling me about the havoc wreaked on her sugar control with gluten free products. Brown rice flour has a very high glycemic index apparently. Thanks. Hi Jenna! You could try making them with coconut flour which has a low G.I. and almond flour instead. However, you'd need to make some substitutions as it wouldn't be a one to one ratio. I haven't tried it yet so I can't give you exact guidance but you'd need to add more liquid. If you have a sense of what a waffle/pancake batter should be then when you make it you can just add as much liquid as you think it needs because it's hard for me to describe. Basically runny but not too runny, thicker than a cake better, way thinner than a muffin batter. Hope that helps! Can I omit the protein powder? I was so excited to try these but they didn't work out for me this morning :( The outside of the waffles got too dark and crispy loooong before the inside wasn't mushy. I tried to salvage the rest of the batter by making pancakes (didn't trust the waffle maker at this point) and tried to do them low and slow. They took forever to bubble through to the other side, but when they did, they flipped well! Unfortunately once they were browned on the other side, they were still too mushy in the middle :( Maybe I'll try with coconut flour to absorb some more of the liquid? Hi Whittney, sorry to hear they didn't work. It sounds like your waffle maker was too hot at first and burned the outside. Just like if you are making pancakes and they burn before they cook inside because the pan is too hot. Did you try a different temperature, maybe a touch lower? They are pretty dense so I would imagine they would take quite a while to do on a pan as a pancake. I cannot have seeds so wondering if you have paired other fruit flavours with beets. Hi Deb, blueberries are a great option because the seeds are so small. However, all fruits have seeds unless they' are a hybrid like seedless watermelon. Blueberries go really well with beets too! Yes! That's one of the things I love about waffles, nooooo flipping!! Enjoy! 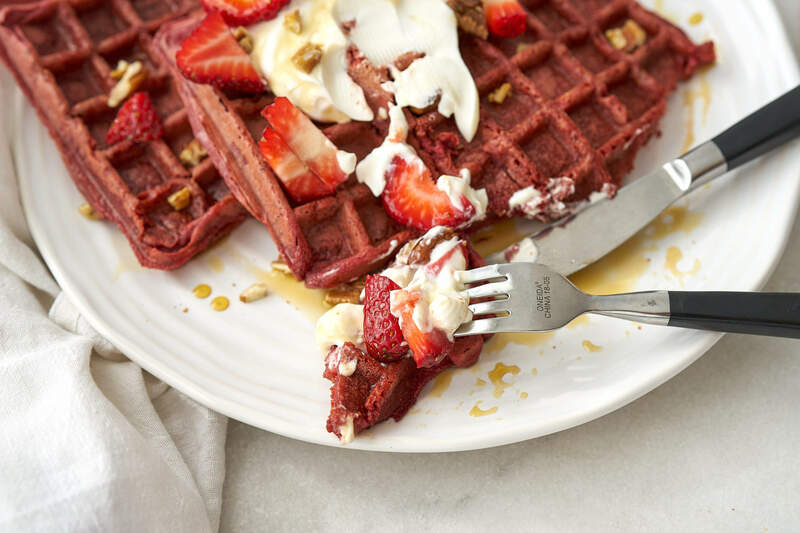 I love strawberries thanks for sharing the beet strawberry waffles.